June 23, 2016 by admin & filed under . My name is Jason Zingler, owner and operator of Serenity Home Inspections. I have been doing inspections for several years and love what I do. The personal satisfaction I receive from helping my clients is very fulfilling. I received my education from Building Inspectors Career Institute, under the supervision of David Goldstein. I then mentored under several veteran inspectors, who provided me with hands on training, extensive inspection experience and practical tricks of the trade. I am currently a member of the Southern New Jersey chapter of American Society of Home Inspectors (ASHI). Becoming a member of ASHI is not essential for home inspectors, but it should be. The continual education received at meetings and seminars is second to none. Please remember that my services do not end once the inspection is over. I am your inspector for as long as you own your new home. Please feel free to call me with any questions you may have in the future. 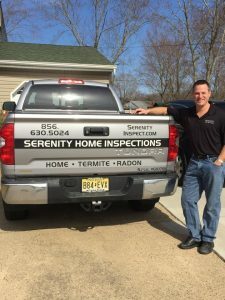 Serenity Home Inspections is a New Jersey home inspection company proudly serving all of Gloucester, Camden, Atlantic, Salem, Cumberland, Cape May and Burlington, Ocean County, Monmouth, Mercer, Middlesex counties. Additional travel fees may apply to areas outside these counties. © 2019 Serenity Home Inspections. Please allow 24 hours for confirmation. If you cannot wait for me to respond please call: 856-630-5024. Do you need this inspection to be on a specific date and time? You may specify these, however, special request dates and times are subject to current availability.